If you’re looking to make your festive season truly merry and bright, look no further than these locations where Christmas lights are the main attraction in Metro Vancouver & the Fraser Valley. With Metro Vancouver’s many trees, green spaces and natural setting, lighting up for the holidays is must-do. Stop by for a spectacular photo-op and even some pretty amazing light shows across the region!!! Welcome to Riverwood, we invite you to view this unbelievable townhouse in a family oriented, master planned community in Port Coquitlam. This home is full of updates, which include the kitchen (with Gas Stove), bathrooms, bamboo hardwood floor etc..., and it's ready to move in! The main floor kitchen offers a great eating area along with a walk out patio and family room. Minutes away from Blakeburn Elementary & Terry Fox Secondary which are one of the most desirable schools in Port Coquitlam. Close to shopping, transit, the new Blakeburn Lagoon Park and all amenities this home would be a great long term family home. Open Houses on October 19 from 6 - 7:30 pm, October 21 from 1 - 4 pm & October 22 from 1 - 3 pm! I've lived in the Metro Vancouver area since the early 90's, my parents took a gamble and left everything they had and knew in London, England for this up and coming area of Canada. They were looking for a better place to raise my brother and I (we both thank them for the brave choice they made!). In the 25 years or so that I've been here, I've seen a lot of change some for the better and some not as much, but I can still say there's no place I would rather live and now raise my own kid's. In the media, social media, etc... you hear a lot of opinion's on Metro Vancouver Real Estate and what's going on. Great buy for first time buyers or investors, potential to hold and wait for Future Development, OCP calls for Townhouses. If you're investor this property will cash-flow (call for details & Cash-flow Analysis). You'll find one of the cities biggest infrastructure projects just breaking ground, the New Recreation Complex, slated to be completed in 2021 just down the street (Video). A proposed adjacent private development to the new complex is to include a mix of apartment buildings, seniors' and rental housing, and a restaurant or café. Brand New Deck, Electrical Panel and Service, new Appliances and more. 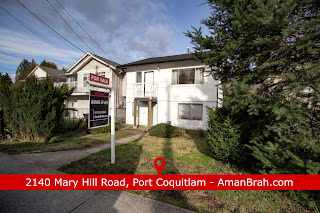 Centrally located within walking distance to the WestCoast Express, downtown City of Port Coquitlam, Shopping, and the Port Coquitlam Recreation Complex, etc... Call today for your personal showing! The B.C. Government announced on March 17, 2017 that workers coming to BC through the Provincial Nominee Program can now be exempt from the additional property transfer tax on Foreign National individuals that was put in place in August 2016. Exemptions If you are a foreign national individual who receives confirmation under the B.C. Provincial Nominee Program, you do not pay the 15% additional property transfer tax. Foreign corporations and taxable trustees are not eligible for the exemption. To qualify for this exemption, you must be a confirmed B.C. Provincial Nominee before the property transfer is registered with the Land Title Office and the property must be used as your principal residence. You may claim this exemption only once. If you purchase another property as a foreign national, you must pay the additional property transfer tax. Qualification for every exemption is verified. When it comes to Real Estate, most people think of a home for themselves and their family. There is another aspect to Real Estate that funds an entire Industry in most cities around the world, Real Estate Investment. Whether you’re aware of it or not, anyone that owns a property has an investment in Real Estate, how you choose to operate it is the biggest difference. Real Estate can be a huge part of your overall Investment Portfolio or it can be your Investment Portfolio. Surrounded with the right team and advisor’s most investors will never go wrong with an investment property. Your team will consist of a Realtor®, Accountant and Lawyer when you start out, this will grow as your portfolio does. The people and team you trust to work with should be able to advise you whether you’re buying your first property or ‘Door’ 500. Not every Realtor®, Mortgage Broker, Accountant and Lawyer knows Real Estate Investment, so these initial decisions will lay your Portfolio foundation.